These delicious mediterranean potatoes are best enjoyed alongside a barbecued roast. Boil the potatoes in salted water for 10 minutes then allow to cool. Break up the garlic bulb but don't peel. Next, strip the rosemary leaves from the stalks. Then to a large bowl add the garlic, rosemary and all other ingredients, followed by a good drizzle of olive oil. Finally season with salt and pepper. Prepare the barbecue for direct heat - approx. 240°C. 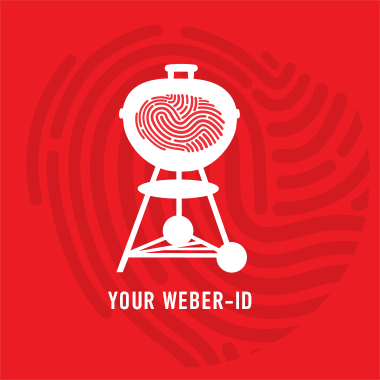 If using a charcoal barbecue, you need 1 Weber Rapidfire Chimney Starter of lit briquettes. Place an aluminium tray between the briquettes to collect the juices. Place all the ingredients into the Rotisserie Fine Mesh Basket then slot the spit into the rotisserie motor. Switch on and leave to turn with the barbecue lid down for approx. 30 minutes. Tip: If the baby potatoes you are using are rather large, simply slice in half to ensure even roasting.